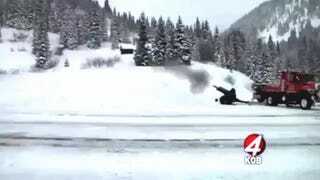 How Does Colorado Clear Snow From Mountain Passes? Howitzers. This has to be one of the more interesting ways to clear snow. In Colorado, road crews have a unique way to preemptively take care of snow build up in mountain passes: a World War II era 105-millimeter howitzer that they lease from the US Army. The crews use precise shots to create avalanches, clearing steep slopes of snow in a controlled fashion. Crews then go take care of the snow that comes down, leaving the roads safe for travelers. That’s gotta be a fun day on the job.